This is a word cloud. You may have seen something like it on different social tagging sites such as del.icio.us, flickr, and others. This particular word cloud was generated by a cool site which offers t-shirts for bloggers. Put in your blog name, and URL and voila! 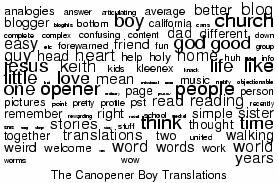 A word cloud is generated from commonly used words on your site. Of course, buying the t-shirt is optional! Loved the Snap T shirt word cloud site. Thanks for sharing. . .